Romance for recorder and string quartet is a new, and revised, version of a work (originally for clarinet and piano) written in 1964, when I was a first year student at the Royal Academy of Music. It was written for a fellow student, Robert Hill, who later became principal clarinet of the London Philharmonic Orchestra. 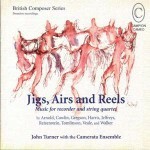 This new version of the Romance was specially written in 2004 for a commercial recording on the Campion label, performed by John Turner (the dedicatee), and the Camerata Ensemble.